Having completed his fourth year of group piano lessons with Yamaha music last year, DS1 is now getting private piano lessons (0.5 hrs for $33 each week) and studying for his AMEB 1st Grade 'Music for Leisure' Pianoforte exam in August. I decided it was about time we bought a real piano for him to practice on. I already own a small Palings (rebranded Kawai) 'Grand' piano my mother bought for me twenty years ago, but it was too large for the house we moved into six years ago and is currently stored at my parent's farm house about three hours drive from Sydney! Although the electronic keyboard DS1 has been practicing on has a 'touch' mode, it isn't really anything like the feel of an acoustic piano (or good quality electric piano), and he has a bit of trouble adjusting when playing his pieces on his teacher's Yamaha Grand piano during his lessons. DS1 is pretty keen on the piano, and enjoys doing his 30 minutes practice each day, so I'm happy to spend some extra money on a decent instrument. I was planning to spend around $1000-$2000 or less on a second hand piano, and asked my father to keep a look out for any bargains. There are lots of Yamaha U3's around for $2,500 or more, but I was hoping to find something a bit cheaper that is in good enough condition for DS1 (and later on DS2) to practice on. 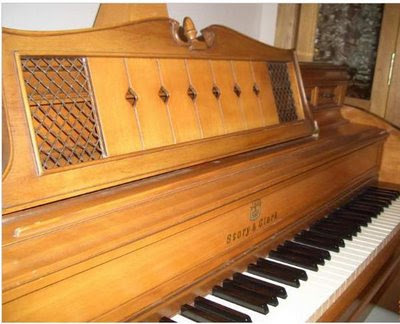 I found an advert in the Trading Post online for a 1970 Story & Clark piano this afternoon, and sent my father to have a look if it was any good. It looked nice enough in the online photos and was for private sale asking $800 or so. My father thought that it was in quite good condition, so I took DW and the kids to have a look this evening after DS1's Judo lesson and bought it for $650. It will cost about $180 to have piano movers take it to our house next Monday, and although it seems reasonably in tune it will need a tune up and some minor maintenance work fairly soon, but I expect the total cost will still come in under $1,000. Since DS1 and DS2 will probably spend around 6,000 hours practicing on this piano over the next 15 years or more, it seems a good investment. Especially compared to the cost of lessons over that time, which will probably add up to more than $40,000! Also, I'll have a chance to brush up on my piano technique.